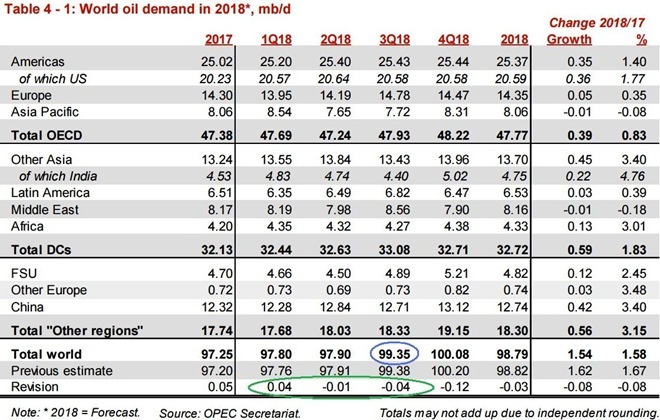 oil prices fell for the first time in 5 weeks on a pair of reports showing growing US oil stockpiles and on a broad based selloff in financial markets globally…after hitting a 4 year high and closing 1.3% higher at $74.34 a barrel last week, prices for US crude oil contracts for November delivery recovered from a sharp morning drop to end just 5 cents lower at $74.29 a barrel on Monday, after a new report showed a small drop in oil inventories at the key US storage hub at Cushing, Oklahoma, and as investors bet that a new Chinese monetary stimulus would stimulate crude demand…prices then rose 67 cents to $74.96 a barrel on Tuesday, on evidence of falling Iranian crude exports and on oil production shutdowns in the Gulf of Mexico due to Hurricane Michael…however, with a major stock market selloff gathering steam on Wednesday, oil prices ignored those concerns and followed equities lower, closing down $1.79 at $73.17 a barrel, and extended those losses in post-settlement trade after the American Petroleum Institute reported that US crude inventories rose by 9.7 million barrels over the prior week…oil prices continued to tank on Thursday, falling $2.20 to $70.97 a barrel, as stock markets continued falling and as the EIA confirmed a much larger-than-expected increase U.S. crude inventories…as equity markets steadied and then rose on Friday, oil prices followed stocks higher, rising 37 cents to $71.34 a barrel, even as the International Energy Agency trimmed its forecasts for world oil demand growth for this year and next…US crude prices thus ended with a loss of 4% on the week, while Brent crude for December, the international benchmark, recovered from a Friday morning drop of over a dollar to end up 17 cents at $80.43 a barrel, still with a loss of 4.4% for the week…. 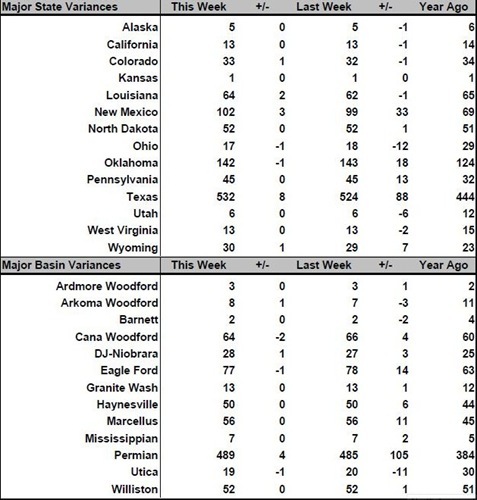 this week’s natural gas storage report from the EIA for week ending October 5th indicated that natural gas in storage in the US rose by 90 billion cubic feet to 2,956 billion cubic feet during that week, which left our gas supplies 627 billion cubic feet, or 17.5% below the 3,583 billion cubic feet that were in storage on October 6th of last year, and 607 billion cubic feet, or 17.0% below the five-year average of 3,563 billion cubic feet of natural gas that are typically in storage after the first week of October….this week’s 90 billion cubic feet increase in natural gas supplies was on target with market expectations that clustered in the upper 80s to lower 90s billion cubic feet range, and also matched the 90 billion cubic foot average of natural gas that have typically been added to storage during the first week of October in recent years, but was still only the 4th average or above average inventory increase in the past fourteen weeks…natural gas storage facilities in the Midwest saw a 35 billion cubic feet increase this week, reducing their supply deficit to 13.2% below normal, while supplies in the East increased by 27 billion cubic feet and are now only 9.1% below normal for this time of year…meanwhile, the South Central region saw a 25 billion cubic feet increase in their supplies, as their natural gas storage deficit decreased to 25.0% below their five-year average, but there was no addition to storage in the Pacific region, where natural gas supplies are now 22.9% below normal for this time of year…. meanwhile, US oil refineries were using 16,239,000 barrels of crude per day during the week ending October 5th, 352,000 barrels per day less than the amount of oil they used during the prior week, while over the same period 669,000 barrels of oil per day were reportedly being added to the oil that’s in storage in the US….hence, this week’s crude oil figures from the EIA would seem to indicate that our total working supply of oil from net imports and from oilfield production was 887,000 fewer barrels per day than what refineries reported they used during the week plus what oil was added to storage….to account for that disparity between the supply of oil and the consumption or new storage of it, the EIA needed to insert a (+887,000) barrel per day figure onto line 13 of the weekly U.S. Petroleum Balance Sheet to make the reported data for the daily supply of oil and the consumption of it balance out, essentially a fudge factor that is labeled in their footnotes as “unaccounted for crude oil”…with unaccounted for crude oil as large a factor as that, we have to figure one or more of this week’s oil metrics is in error by a statistically significant amount (for more on how this weekly oil data is gathered, and the possible reasons for that “unaccounted for” oil, see this EIA explainer)…. 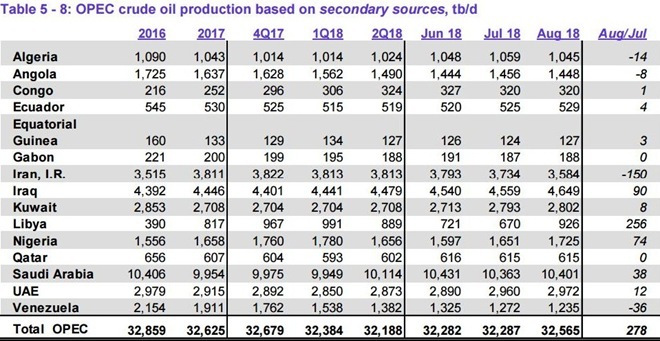 with the decrease in the amount of oil being refined this week, gasoline output from our refineries was likewise lower, decreasing by 239,000 barrels per day to 9,711,000 barrels per day during the week ending October 5th, after our refineries’ gasoline output had increased by 118,000 barrels per day during the week ending September 28th…with the lower output, our gasoline production during the week was thus fractionally lower than the 9,741,000 barrels of gasoline that were being produced daily during the same week last year…meanwhile, our refineries’ production of distillate fuels (diesel fuel and heat oil) decreased by just 1,000 barrels per day to 5,028,000 barrels per day, after that output had increased by 34,000 barrels per day the prior week….hence, this week’s distillates production was still 1.3% higher than the 4,964,000 barrels of distillates per day that were being produced during the week ending October 6th 2017, as refineries continue to catch up with this summer’s distillates shortfall…. 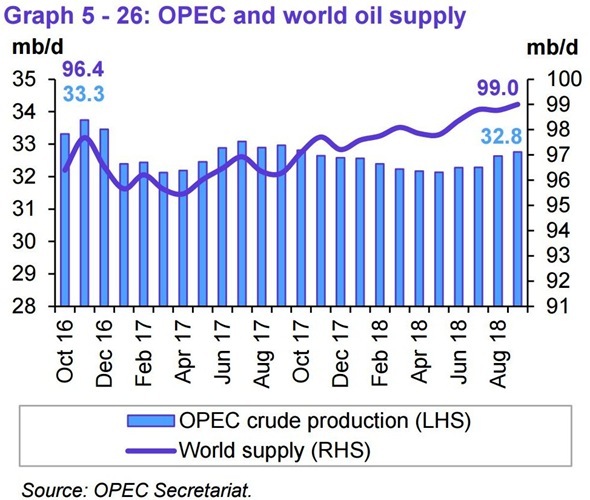 while global demand for the 3rd quarter was reportedly revised 0.04 million barrels per day lower, that’s a rounded change from the 99.38 million barrels of oil per day that was reported last month, or 0.03 million barrels less than the rounded figure we used last month…meanwhile, total global oil output for August was revised down by 110,000 barrels per day at the same time, which means that the global shortfall of 500,000 barrels per day that we had figured for August last month should thus be revised to 580,000 barrels per day…also a month ago, we estimated there was a shortfall of around 990,000 barrels per day in global oil production vis-a vis the 99.38 million barrels per day demand then reported for July, so we have to revise our July oil shortfall figure to 960,000 barrels per day to account for the downward revision in demand…. offshore drilling in the Gulf of Mexico was unchanged from last week at 22 rigs, which was up from the 20 Gulf of Mexico rigs active a year ago…in addition, a single rig continued to drill offshore from Alaska this week, so the total national offshore count is at rigs, up by 3 from last year’s total of 20 offshore rigs, as a year ago there was no offshore drilling other than in the Gulf…..